Our web site has been up since February of 1999, and we have placed hundreds of used and new bells in some really nice homes. Most of our calls are from people who have always wanted a bell but didn't know where to get one or how to go about it. Most all start the conversation this way: "I want to buy a bell but know nothing about them". Some have the SHOCK of pricing new ones for their church, which is what we would like you to do. Get the price and shipping time on new ones, then call us. Next, you must decide how you want to use the bell. Do you want the bell to swing, or just the clapper to swing when pulled by a rope and the bell staying still? 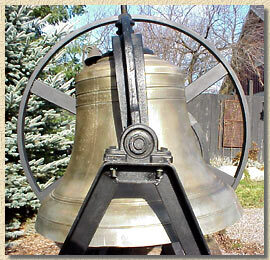 If the bell is going to be used in a Church tower it should be a complete swinging one with wheel and be mounted in an A frame stand or to pillow block bearings (like the bell shown above left). It is not a good idea to hang a bell in a tower if you want it to swing. A swinging bell should sit on something (floor or beam) not hang. If the bell must hang, it needs to be bolted to a beam, ridged, and have a line to the clapper, over to a pulley, and then down to the pulling area. The next thing you must decide is if you want a cast iron, brass, or bronze bell. If it is mostly for looks and not sound, cast iron would be ok. If you want it to shine and sound OK, then brass would be the one. But if you want a good quality sound and a longer lasting bell with a good look, then bronze is the one. Sometimes cost is the main factor, even though our bronze bells are priced about half of the cost of new ones, it is still out of the reach for some. So one of our cast iron bells may fit the bill. Then you need to know what size bell you need. We measure our bells by their diameter (bell only). Church bells start at about 28" and go on up to? School house bells go from 28" down to about 20" Victory bells start at around 24" and go on up to huge. If any of these bells are going to be used at ground level or there about, a simple rope arm is better than a wheel for swinging the bell. If you are ready to order or have any questions about our USED bells. Give us a call, we are on Eastern Time and you can usually get a real person between 10 am. and 4 pm. We hope this helps in your decision making.